Benitoite was first described in 1907 by George D. Louderback, who named it benitoite. "as it occurs near the head waters of the San Benito River in San Benito County, California." It is the California State gemstone. Benitoite is a rare blue barium titanium silicate mineral found in hydrothermally altered serpentinite and also in schists. Benitoite fluoresces under short wave ultraviolet light, appearing light blue in color. Benitoite is a member of the silicates group. It comes in at a 6-6-1/2 on the Mohs Scale. It has a conchoidal to uneven fracture and an indistinct cleavage. It has a trigonal/hexagonal crystal system with a vitreous luster. Benitoite is typically blue, purple, pink, white, colorless and often multicolored. The stone is transparent to translucent with a colorless streak. Its chemical composition is BaT1Si3O9. Benitoite is typically found with some combination of natrolite, joaquinite and neptunite on a greenish-gray serpentinite base. Benitoites' main uses are as collectors' specimens, especially in specimens which show off its commonly associated minerals. Benitoites' hardness also makes it suitable for use as a gemstone, though the general lack of suitable material has limited this use. Its name comes from the Persian word 'Lazhward', meaning 'blue', in reference to its color. There are over 45 well-known forms, and over 100 forms have been described. Azurite is often pseudomorphed to Malachite, and the two are very frequently found together. It is a member of the carbonates group and its chemical composition is Cu3+2(CO3)2(OH)2. It has a perfect cleavage and has a conchoidal fracture. It is a very soft stone coming in at 3-1/2 to 4 on the Mohs Scale. Its specific gravity is 3.77 to 3.78. This mineral's typical crystal system is monoclinic. It forms as tabular and short prismatic crystals which may be twinned. It also occurs in massive, nodular, stalactitic and earthy habits. It is usually a rich deep azure blue. The streak is a paler blue. Azurite varies from transparent to opaque and it has a vitreous or dull luster. Azurite is soluable in hydrochloric acid with effervescence. It fuses easily and will turn black when heated. The intense color of Aurite makes it a popular collector's stone. However, bright light, heat, and open air all tend to reduce the intensity of its color over time. To help preserve the deep blue color of a pristine Azurite specimen, collectors should use a cool, dark, sealed storage environment similar to that of its original natural setting. Azurite was used as a blue pigment for centuries. Depending on the degree of fineness to which it was ground, and its basic content of copper carbonate, it gave way to a wide range of blue hues. Hello All, This month, in honor of our July program, we will be changing our mineral of the month to our 'Specimen of the Month'.........................."STROMATOLITES"
Stromatolites are not only Earth's oldest of fossils, but are intriguing in that they are our singular visual portal into deep time on earth, the emergence of life, and the evolving of the beautiful forms of life of modern time. A small piece of stromatolites encodes biological activity perhaps spanning thousands of years. In broad terms, stromatolites are fossil evidence of the prokaryotic life that remains today, as it has always been, the preponderance of biomass in the biosphere. For those that subscribe to the theory of the living earth, it is the prokaryotes that maintain the homeostasis of the earth, rendering the biosphere habitable for all other life. They maintain and recycle the atomic ingredients of which proteins, the essence of life, are made, including oxygen, nitrogen and carbon. We humans are, in simple terms, bags of water filled with proteins and prokaryotic bacteria (the bacteria in your body outnumber the cells in your body about 10 to 1). We humans have descended from organisms that adapted to living in a prokaryotic world, and we humans retain (conserved in evolutionary terms) in our mitochondria the cellular machinery to power our cells that we inherited from the prokaryotes of deep time on earth. Scientists disagree on how to define stromatolites. A common definition goes something like: A lamiated rock formed by the growth of blue-green algae (i.e., cyanobacteria)". This definition is, in fact, such a gross oversimplification as be scientifically useless. It does contain a modicum of truth, however, in that the largest volume of stromatolite formations was likely formed by biogenic processes involving photosynthetic cyanobacteria. Cyanobacteria’s metabolic byproduct, oxygen, rusted the earth, pumped enormous oxygen poison to them into earth’s atmosphere, and in so doing paved the way for aerobic-based life to emerge and diversify; cyanobacteria’s contributions to life led to their own prodigious decline. Stromatolites and their close cousins the thrombolites, are rock-like buildups of microbial mats that form in limestone- or dolostone-forming environments. Together with oncoids (formerly called "algal biscuits" or "Girvanella"), they typically form by the baffling, trapping, and precipitation of particles by communities of microorganisms such as bacteria and algae. In some cases, they can form inorganically, for example when seawaters are oversaturated with certains chemicals resulting in precipitation. Stromatolites are defined as laminated accretionary structures that have synoptic relief (i.e., they stick up above the seafloor). Stromatolite-building communities include the oldest known fossils, dating back some 3.5 billion years when the environments of Earth were too hostile to support life as we know it today. We can presume that the microbial communities consisted of complex consortia of species with diverse metabolic needs, and that competition for resources and differing motility among them created the intricate structures we observe in these ancient fossils. Microbial communities diversified through time, with eukaryotic organisms eventually joining the mix. Excluding some exceedingly rare Precambrian fossils such as the Ediacaran fauna, stromatolites and are the only fossils encoding the first 7/8th of the history of life on earth. They encode the role that ancient microorganisms played in the evolution of life on earth and in shaping earth's environments. The fossil record of stromatolites is astonishingly extensive, spanning some four billion years of geological history with the forming organisms possibly having occupied every conceivable environment that ever existed on earth. Today, stromatolites are nearly extinct in marine environments, living a precarious existence in only a few localities worldwide. Modern stromatolites were first discovered in Shark Bay, Australia in 1956, and throughout western Australia in both marine and non-marine environments. 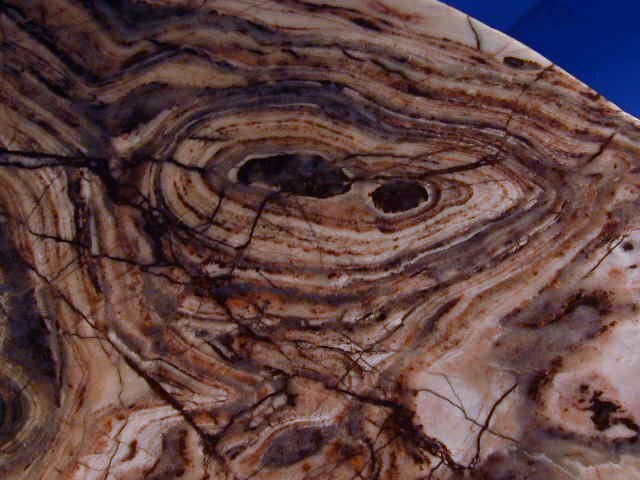 New stromatolite localities have continued to be discovered in various places such as the Bahamas, the Indian Ocean and Yellowstone National Park, to name but a few localities. Garnet is named from the word 'grantum', meaning pomegranate, for its resemblance to the fruit's seeds. The Garnet mineral group is compromised of isomorphous minerals identical in crystal structure and in many cases difficult to determine one from another. The members of this group intermingle with one another, within limits. There are seven lesser known members of the Garnet family known as Knorringite, Majorite, Calderite, Goldmanite, Schorlomite, Kimzeyite & Morimotoite. There are also two hydro garnet members know as Hibschite and Katoite. These nine members are extremely rare and very little is actually known about them. Garnets are a member of the silicates group. They have a hardness of 6-1/2 to 7-1/2 on the Mohs scale. Garnets have no cleavage and and un-even to conchoidal fracture. It's specific gravity is 4.1 to 4.3. Garnet has a white streak and is transparent to opaque and has a vitreous luster. Garnets form in a variety of ultrabasic igneous rocks, associated serpentines & metamorphosed rocks such as schist. Garnet fuses fairly easily and is virtually insoluble in acids. Garnet is one of the only gemstones on the planet that is not heat treated or irradiated or undergoes any other type of man made process in order to enhance the quality of the finished gemstone. From the Cingalese word"tourmali," this was the name given to colored gem 'zircons' found on the island of Sri Lanka (Ceylon). It wasn't until the early 1800s that it was discovered that some of these "zircons" arriving in European gem centers from the far east were actually a previously un-described mineral. The trigonal crystals formed by this group are often vertically striated. These crystals may be rounded triangular in cross-section. It also forms in massive and compact habits. Seven distinct species make up the Tourmaline group. They are Elbaite (multi hued), Schorl (black), Buergerite and Dravite (brown), Rubellite (pink), Chromedravite (green) and Uvite (black, brown, yellowy green). Crystals are often pink at one end and green at the other and may be of considerable size. Tourmalines form in granites and pegmatites as well as in some metamorphic rocks. They may be found with a wide array of minerals including beryl, zircon, quartz and feldspar. This group is insoluble in acids. The darker minerals tend to fuse with more difficulty than the red and green varieties. The name beryl may possibly come from the greek word 'beryllos' which refers to a number of blue-green stones in antiquity. This precious gemstone mineral occurs as prismatic crystals which are sometimes terminated with small pyramids. The crystals are often striated parallel to their length and may be of massive size. Specimens up to eighteen feet long have been recorded. It also forms in massive, compact and columnar habits. The color varies greatly and gives rise to named varieties one might recognize such as Emerald, Morganite, Heliodor, Goshenite and Aquamarine. There is also a variety in red that was once referred to as Bixbite but has since been proved to be incorrect. This red variety is referred to as Red Beryl. Beryl is a member of the silicates group. Its chemical composition is Be3AI2SI6O18. It is quite durable coming in at 7-8 on the Mohs Scale. It is transparent to translucent with a vitreous luster. It has a white streak. Its specific gravity is 2.6 to 2.9. It has an indistinct cleavage with and uneven to conchoidal fracture. Beryl of various colors is found most commonly in granitic pegmatites, but also occurs in mica schists in the Ural Mountains, and limestone in Colombia. Beryl is often associated with tin and tungsten ore bodies. Beryl is found in Europe in Norway, Austria, Germany, and Ireland, as well as Brazil, Colombia, Madagascar (especially morganite), Russia, South Africa, the United States, and Zambia. U.S. beryl locations are in California, Colorado, Idaho, New Hampshire, North Carolina, South Dakota, and Utah. The name Rhodochrosite comes from the Greek, rhodom, meaning rose and chrosis meaning a coloring refering to it's color. 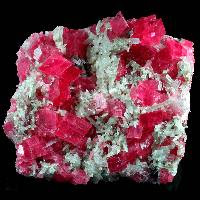 Rhodochrosite commonly occurs as a primary gangue mineral in moderate to low temperature hydrothermal veins also in high temperature metasomatic deposits and sedimentary manganese deposits or more rarely as a late stage hydrothermal mineral in pegmatites. This mineral sometimes forms as rhombohedral, scalenohedral, prismatic or tabular crystals. 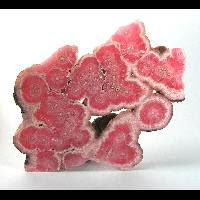 More often, rhodochrosite occurs in massive, granular, stalactitic, glogular, nodular or botryoidal habits. Its color is typically pink to red though it may also be brown, orange or yellowish. Manganese is what gives rhodochrosite its vivid pink to red color. The streak is white. It is transparent to translucent and has a vitreous to pearly luster. It is a member of the carbonates family and its chemical composition is MoCO3. It is very soft coming in at 3-1/2 to 4 on the Moh's Scale. Its specific gravity is 3.7 and has an uneven fracture. Its cleavage is perfect rhombohedral. Rhodochrosite is soluble in warm hydrochloric acid with effervescence.